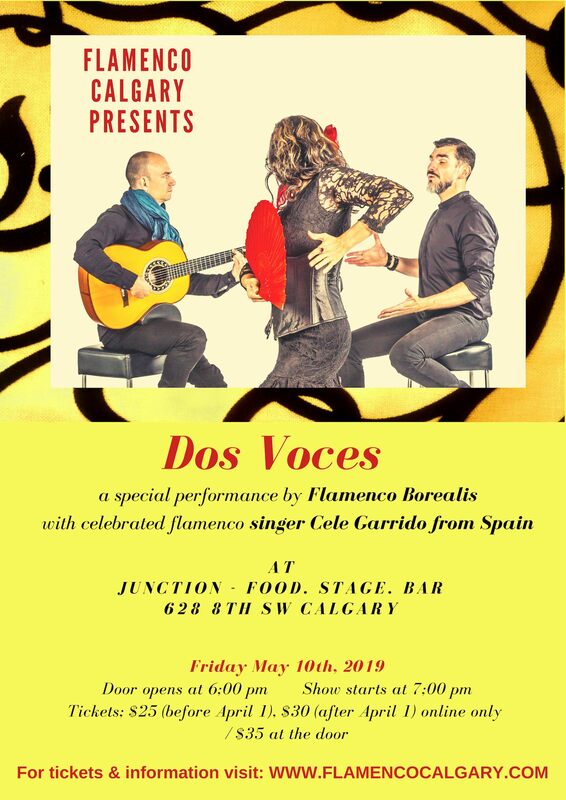 Back from a year in Spain, Flamenco Borealis presents Dos Voces (Two Voices), a show in which flamenco music and dance mingles with arabic tunes and melodies. This meeting of two worlds, so close, yet very different, opens a space where different lyricisms mingle, where nostalgia is expressed in various tones, and where dance recounts more than one story. 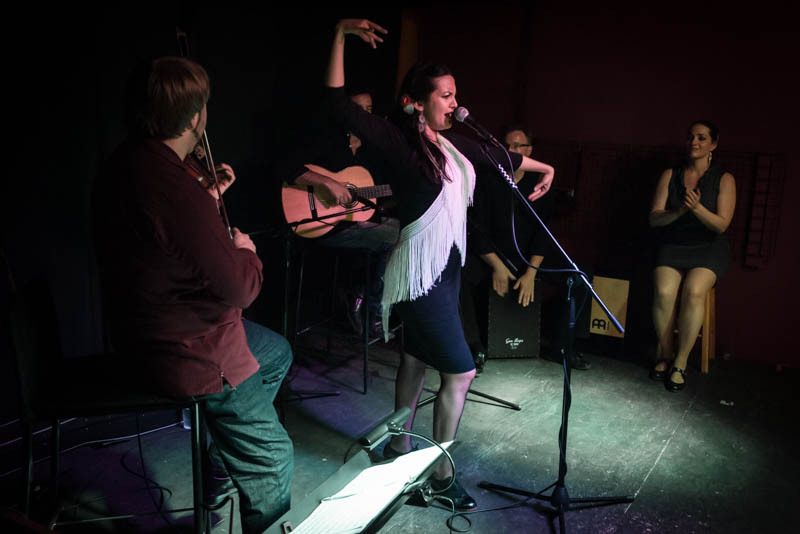 Lina Kazan (flamenco dance and vocals), Daniel Regnier (multi-instrumentalist and vocals) and Nick Horlick (percussion) will be joined by the celebrated flamenco vocalist from Spain Celedonio Garrido. Buy your ticket early and don’t be disappointed as the shows sell out well in advance. Once you have purchased your tickets please contact the venue to reserve your seating. Since expected end time at this event is 9:00 pm, children’s attendance will not be permitted in compliance with the Alberta liquor board bylaws. Buy your tickets now by clicking on the box below! Join Salero Caló Flamenco group for an intimate Flamenco performance of song, music and dance at Junction Stage and Bar. Come and enjoy this Spanish cultural evening while sipping on a glass of wine, savouring a tapa or delighting in a pre-show dinner to complete your cultural experience. 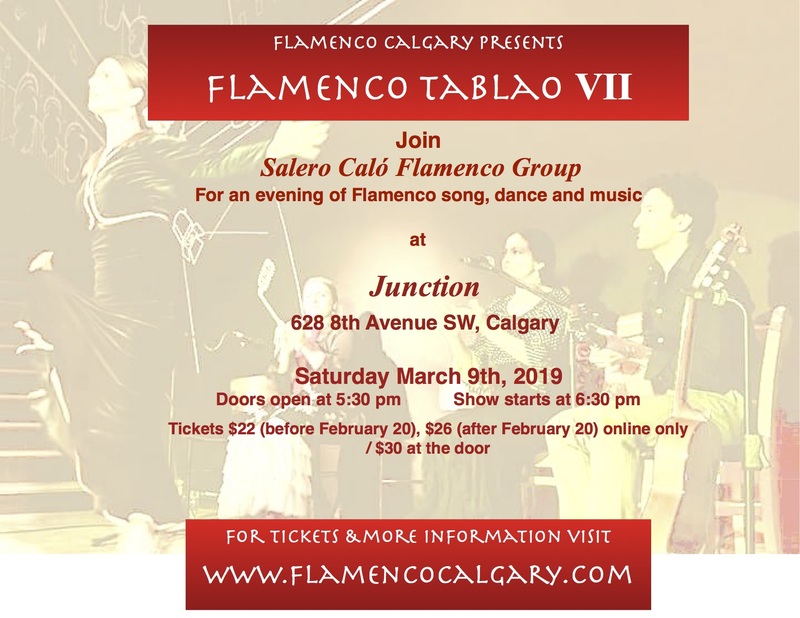 Join Salero Caló Flamenco group for an intimate Flamenco performance of song, music and dance at Junction Stage and Bar. 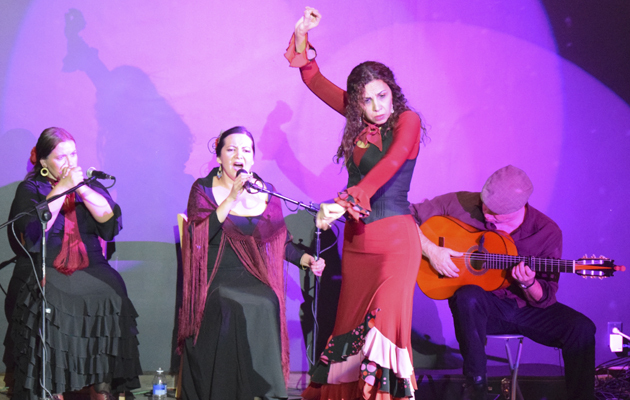 Come and enjoy this Spanish cultural evening while sipping on a glass of wine, savouring a tapa or delighting in a pre-show dinner to complete your cultural experience. This performance will also have an opening act featuring two emerging artists. Buy your ticket early and don’t be disappointed as the shows were sell out well in advance. Once you have purchased your tickets please contact the venue to reserve your seating. Buy your ticket early and don’t be disappointed as the January 13 and March 10th shows were sold out well in advance. Once you have purchased your tickets please contact the venue to reserve your seating. 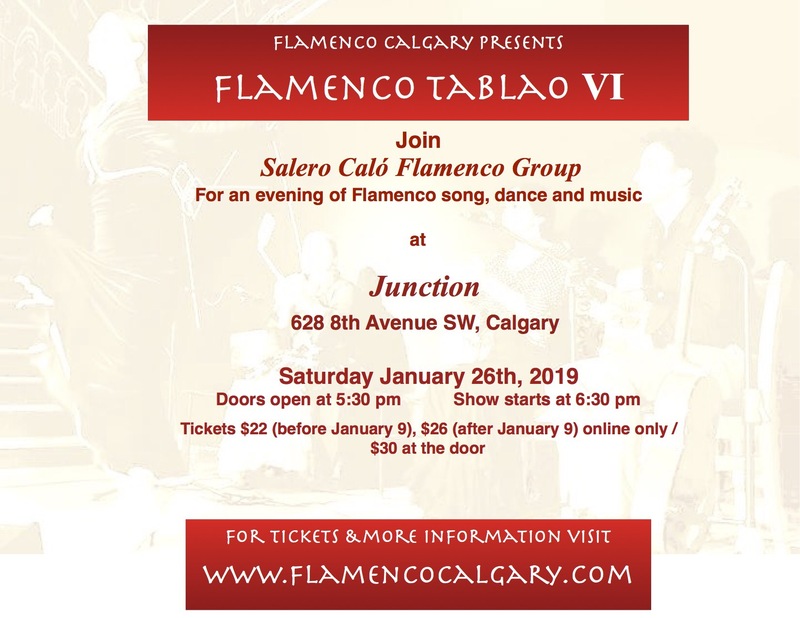 Join Salero Caló Flamenco group for an intimate Flamenco performance of song, music and dance at Junction Stage and Bar. Come and enjoy this Spanish cultural experience while sipping on a glass of wine or enjoying a tapa. Buy your ticket early and don’t be disappointed. The January 13 show was sold out a week in advance. 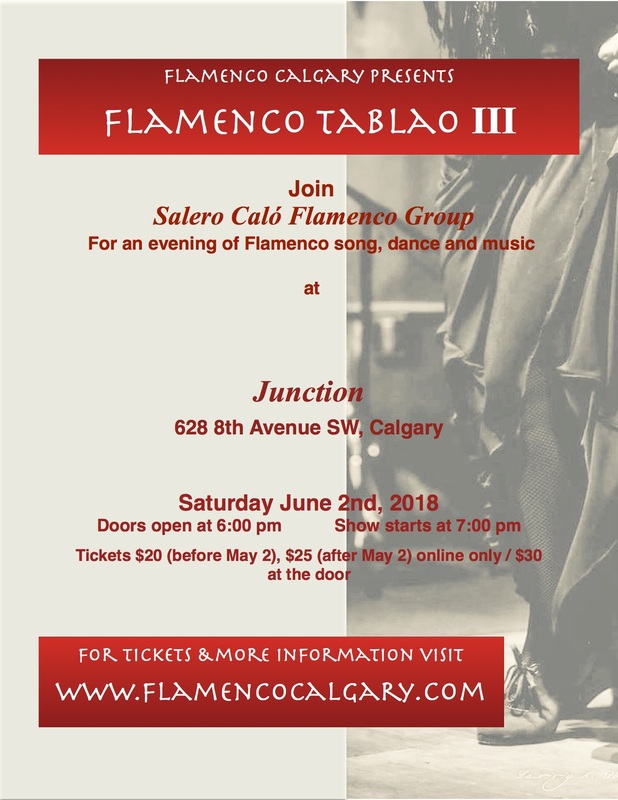 Un público multicultural fue el que se dio cita el 13 de enero pasado en Junction para uno de los eventos que iniciaron la temporada de las presentaciones artísticas y culturales en Calgary: Flamenco Tablao. La presentación los miembros originales de Salero Caló generó gran expectativa, no solo entre los hispanos de la ciudad, sino entre canadienses e integrantes de otros grupos étnicos. El evento tuvo un lleno total y el 100 % de las entradas fueron vendidas. Los ganadores del sorteo de Hispano City Calgary, Lizu Navarro y Yohan Perez Fernandez, y sus acompañantes también pudieron disfrutar del show. La entrega de los artistas en escenas logró conmover a los asistentes, quienes aplaudieron cada uno de los números. El flamenco estuvo bien representado por Annette Morcos (La Mora), fundadora de Salero Caló, en canto y baile; Francesca Canalizo en el baile; Maria Regnier también en el baile; y David Matyas en la guitarra. La noche del pasado sábado quedará grabada en la memoria de quienes tuvieron la oportunidad de estar presentes. Si te perdiste esta presentación, aquí te tenemos algunas imágenes de lo que fue aquella velada.